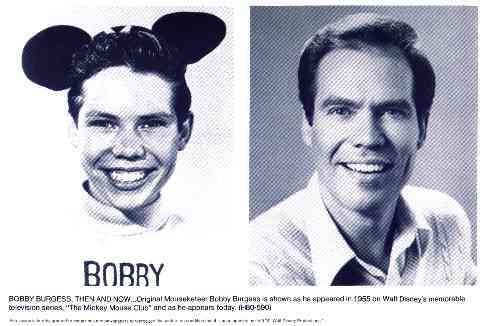 Bobby Burgess was a child prodigy and popular dancer best known for his featured performances on the Lawrence Welk Show from 1961 to 1982. Burgess began his dancing career when he was four years old. By the time he was 11, he had appeared in some 75 television shows in Los Angeles. An agent saw him and called the station and got him signed. By 13, he was a member of Walt Disney's original troupe of Mouseketeers for the next four years. At a dancing school in his native Long Beach, California, fate stepped in and found a ready-made partner for him, Barbara Boylan, another school member, when their teacher paired them in ballroom dancing. Ideal dance partners from the very outset, they vied against countless other ballroom couples in competitions waged all over the country, finally scoring a grand coupe by being named King and Queen of the national Call's Grand Medal Ball, over some 11,000 who had compete. Following this, the duo entered Lawrence Welk's "Calcutta Dance Contest," and Bobby's especially-created routine won top honors for them, netting them a guest appearance on Lawrence's nationwide television show. That was in April, 1961, and an avalanche of acclamatory mail flooded the Welk offices, resulting, finally, in their being named "regulars" on the program by the maestro six months later. When Barbara left the show in 1967, Bobby searched and found Cissy King, of Albuquerque, who became his new dancing partner. Together, they continued the tradition as the dancing stars of Lawrence's popular television program. Meanwhile, Bobby had met Kristie Floren, a daughter of Welk's accordionist Myron Floren, and married her in 1971. When Cissy left the fold in December, 1978, Bobby commenced another search for a suitable dancing partner. His nationwide search for a likely partner to meet the demanding standards was met by Elaine Balden, his current partner, of Dallas, Texas. Elaine's versatility of Latin and ballroom dancing, jazz, ballet, singing and "the right look" and size and personality, have made her the ideal partner for Bobby.